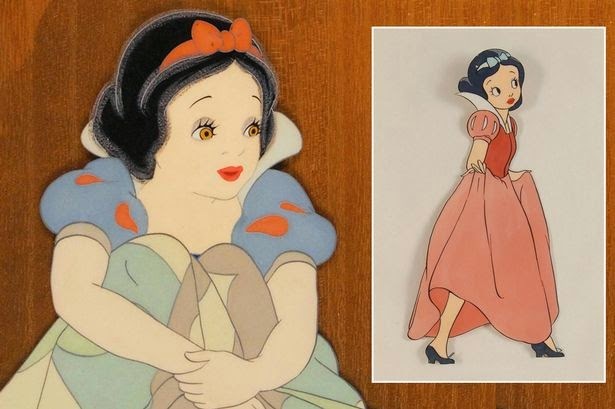 Early Animation Cel - Snow White Too Risqué? 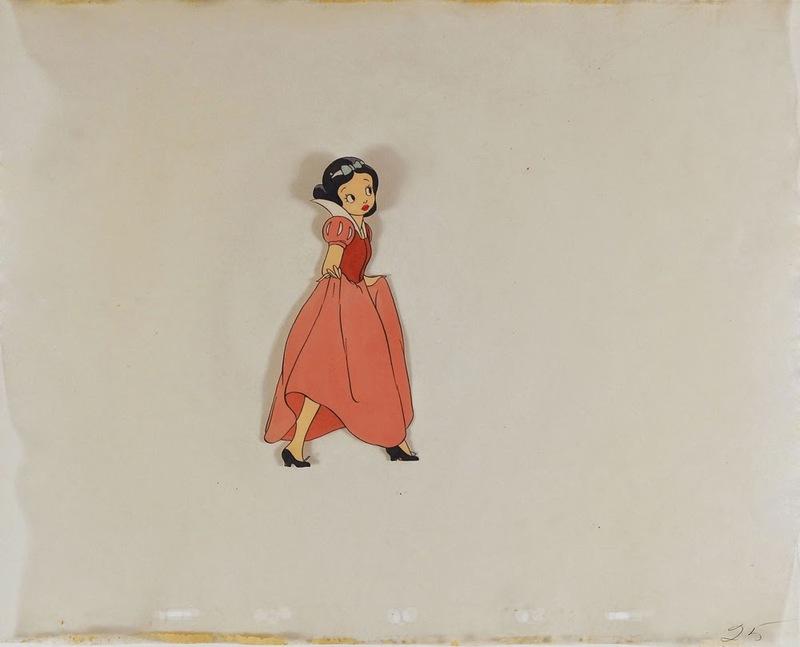 A production cel featuring a very early rendition of Snow White went up for sale this past month at the Massachusetts-based RR Auction. 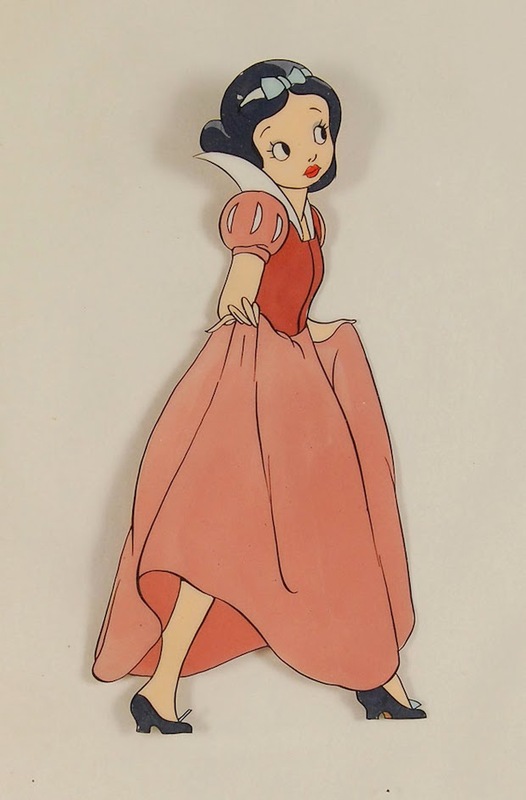 Created circa 1935, she is shown in a long pink dress with a blue bow in her hair--quite possibly the earliest example of a Snow White production cel ever. Cel images via RR Auctions. For nearly 80 years, the piece belonged to the family of Grim Natwick. Grim was one of the two main animators of Snow White, the other being Hamilton Luske. 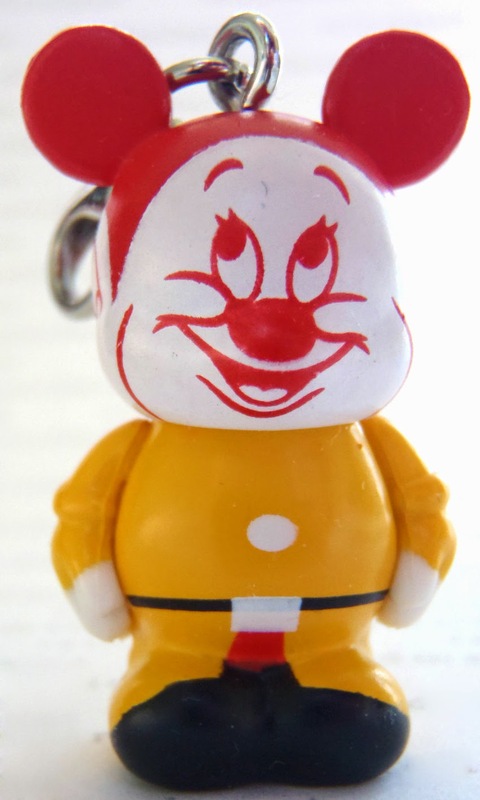 Before coming to Disney to work on the film, Natwick was employed by Fleischer Studios where he was the original animator of Betty Boop. The similarities are quite evident. The full animation cel is complete with peg holes and a cel number at the bottom right; it's not to be mistaken for a color model. Image measures 5" x 2.25", with overall dimensions of 12.25" x 9.75". ...changed this design of the princess because he felt it was too ‘cartoony’—too risqué and reminiscent of Betty Boop—to be used for final production in a more serious film. Bobby Livingston, Exec VP at RR Auction. Comparison shots via the Mirror. 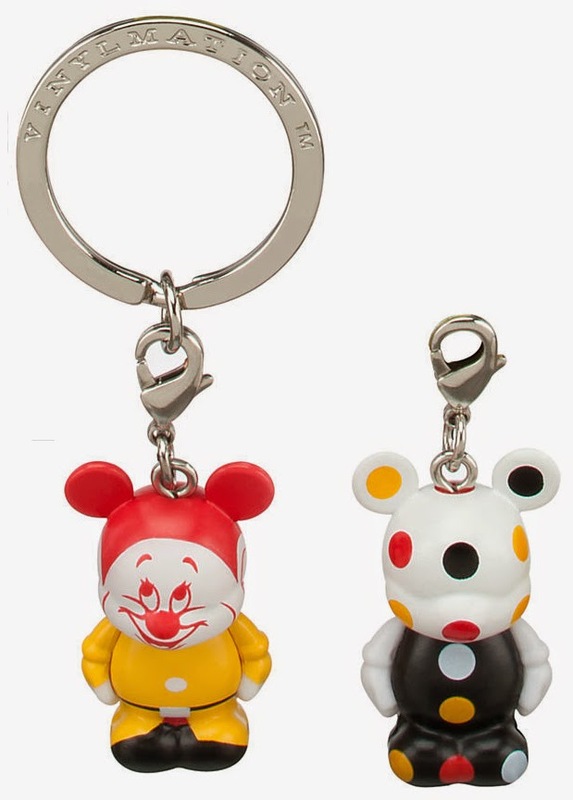 The auction bidding ran from August 14-21, 2014. The cel sold for $4,239.73. 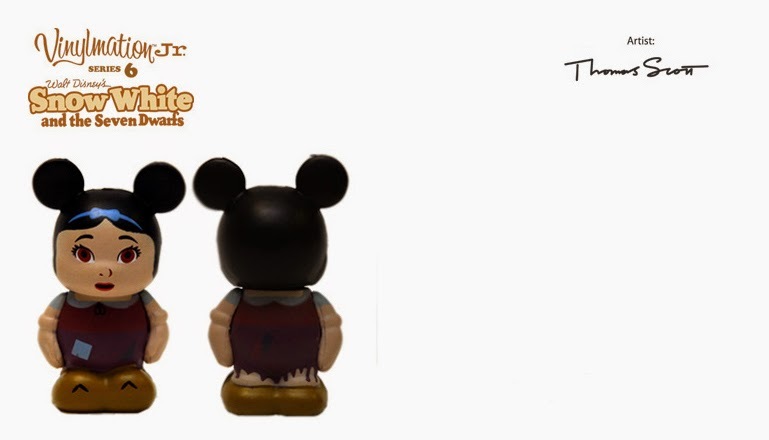 Special thanks to The Disney Freak for the notice on this one. The photo below was snapped earlier this month by 1937fan from Whistle While We Blog. 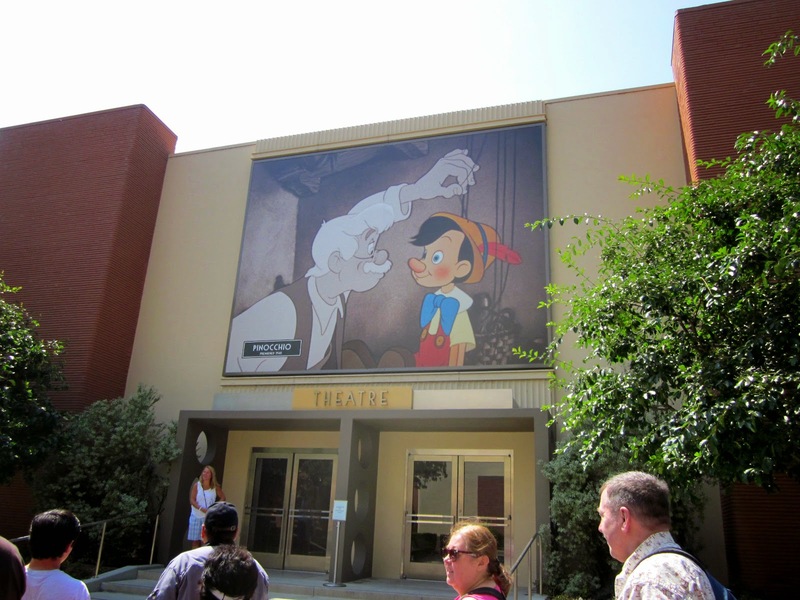 The large banner hung over the entrance to the Main Theatre on the Walt Disney Studios lot in Burbank. In the lower left corner it reads, "Snow White - Premiered 1937". 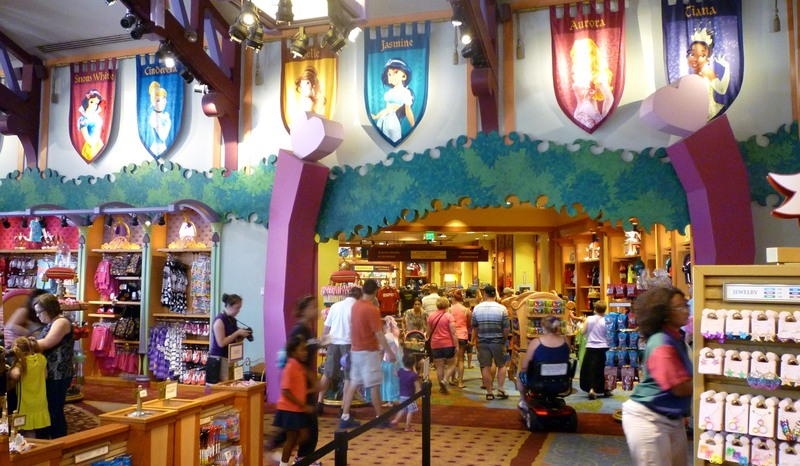 The Disney Main Theatre is located directly across from the old animation building, down the street from the 'Dopey Drive" sign. The lot is not open to the general public, but exclusive D23 fan functions have been held here. 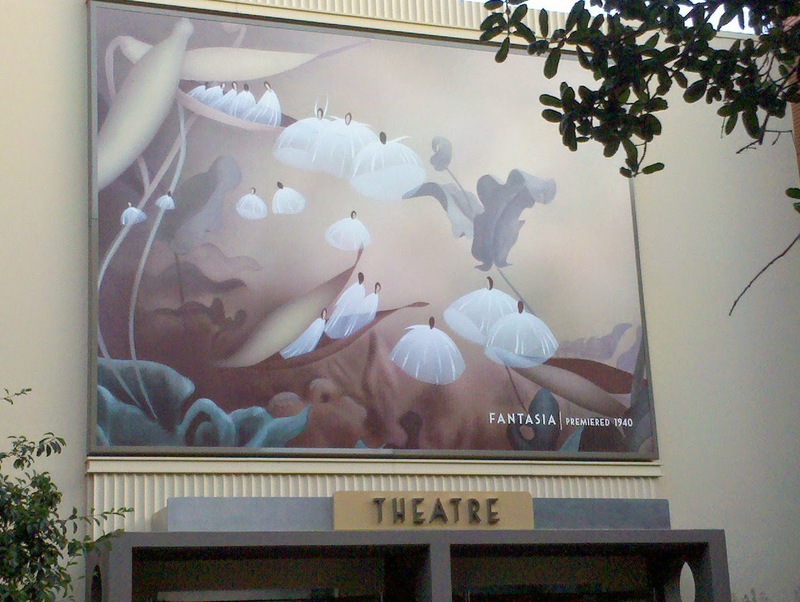 The banner above the theatre entrance changes annually. Over the last few years, 1937fan attended several events and witnessed firsthand the giant artwork. 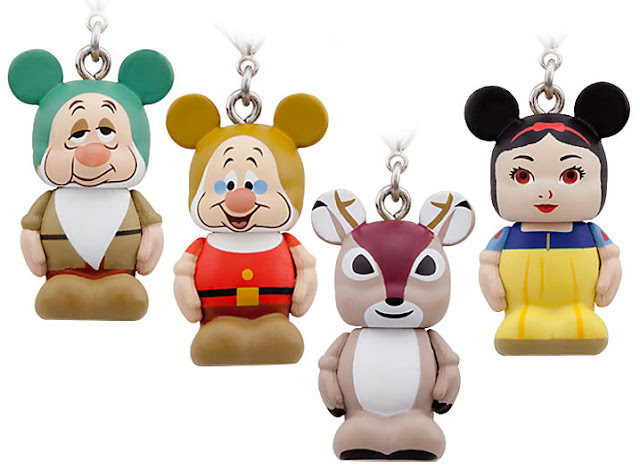 Fantasia was seen in 2010, Pinocchio in April 2012 and May 2013, and Snow White August 2014. 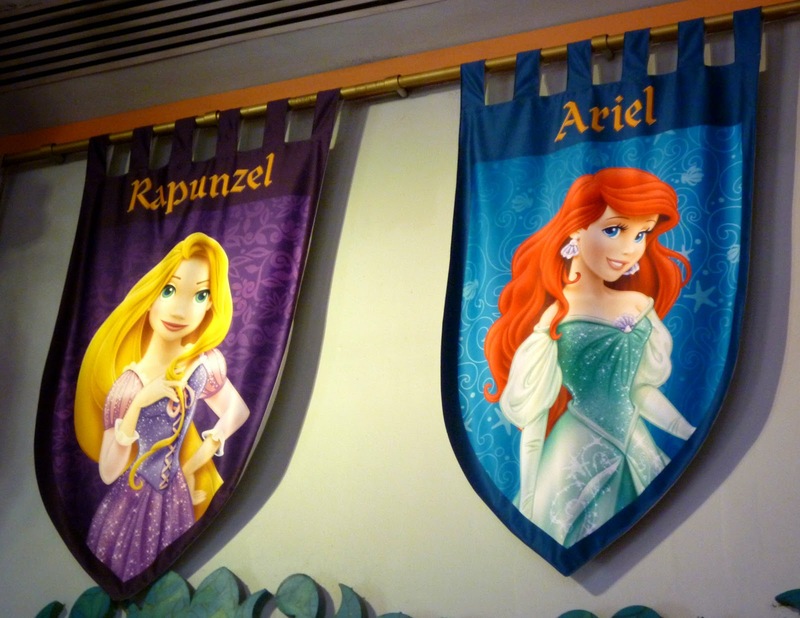 Special thanks to 1937fan for sharing her photos and information on these Disney Studio banners. UPDATE: On September 12, 2014, the giant banner was updated again, this time to Frozen. 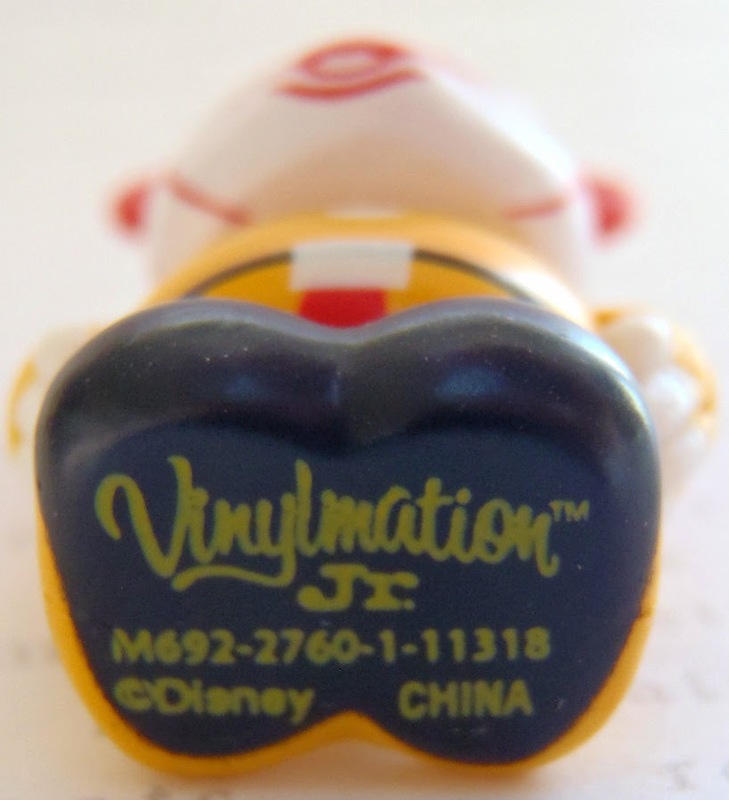 Half the size of the regular Vinylmation figures, the Vinylmation Jrs. 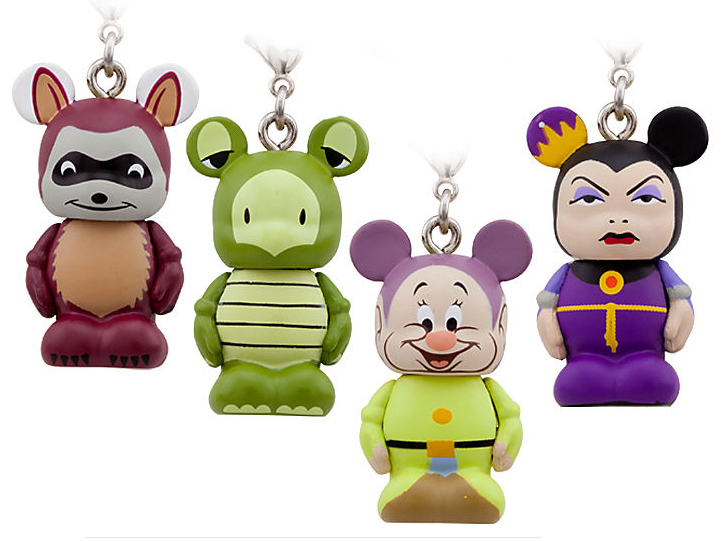 are just 1.5" tall. 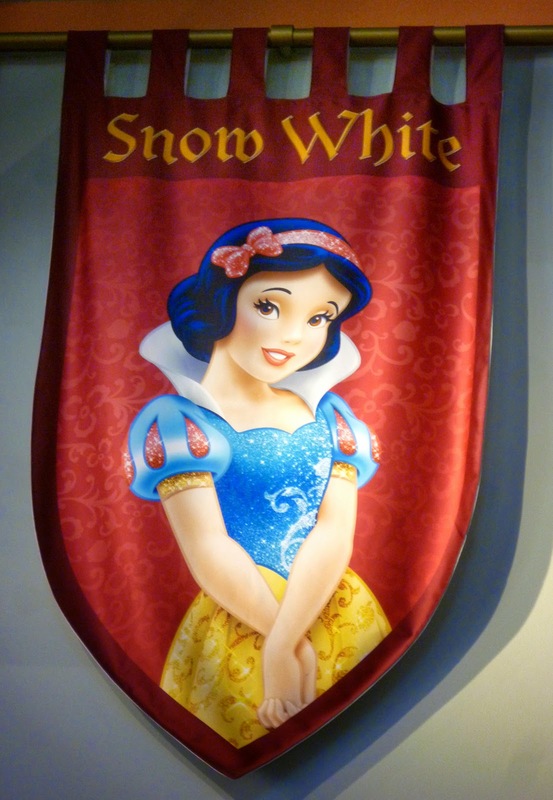 The first of the Snow White-themed characters appeared in 2010, with more to follow. 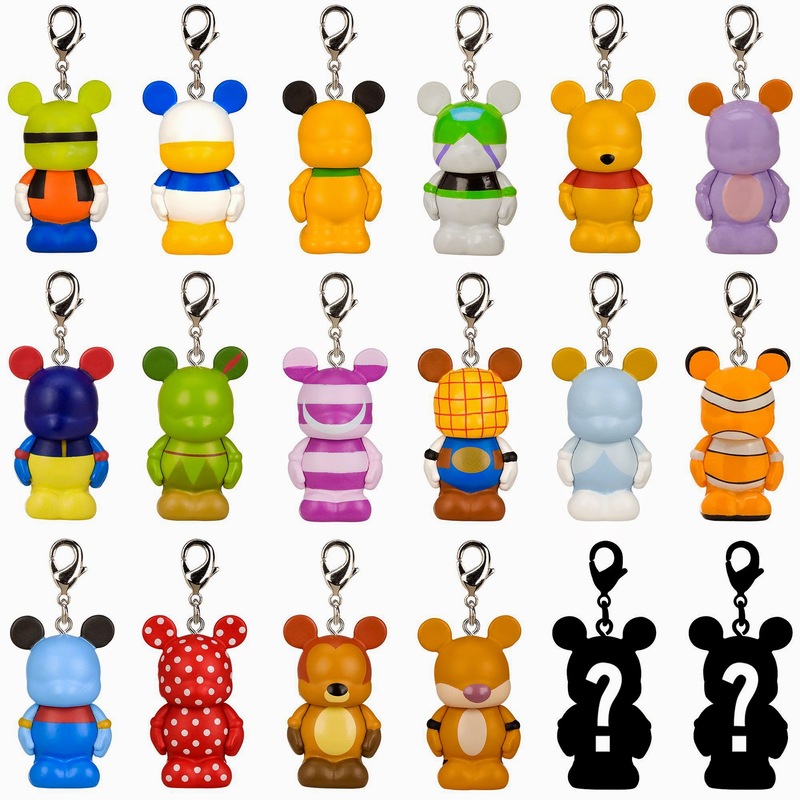 Each has an attached keychain which, if desired, can be removed by simply unscrewing from the top of the head. 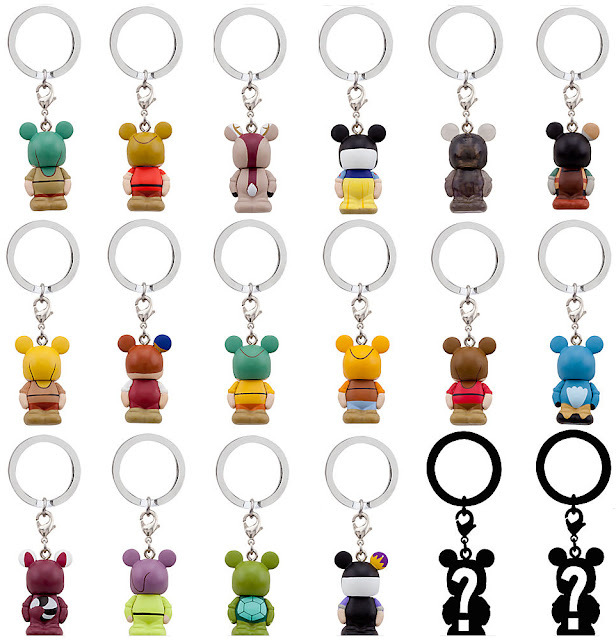 Sold at the theme parks and online at the Disney Store. 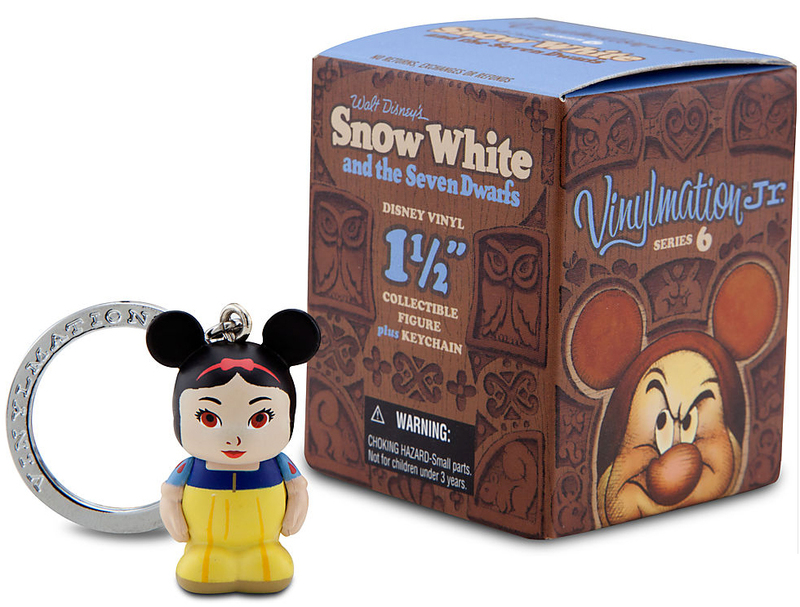 "Snow White" issued June 18, 2010. Artists: Thomas Scott and Maria Clapsis. 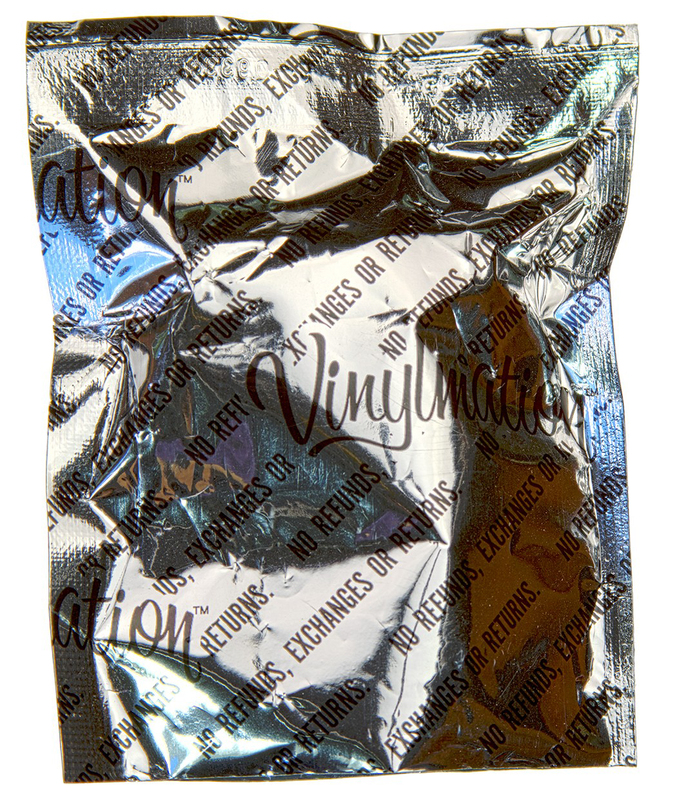 Original retail price $8.95. 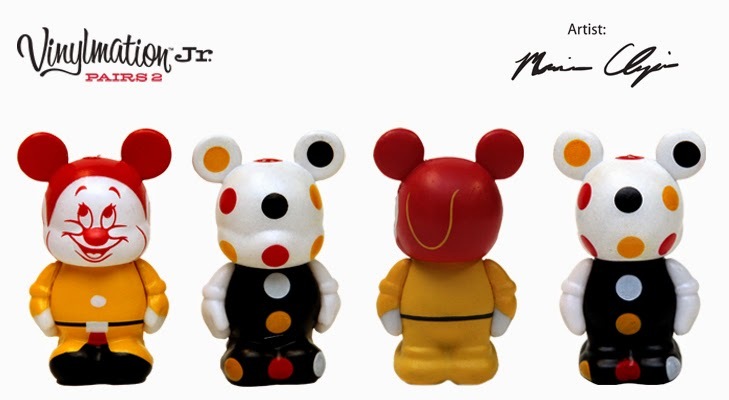 Unofficially referred to as the "color block" series, it features designs inspired by famous color combinations. 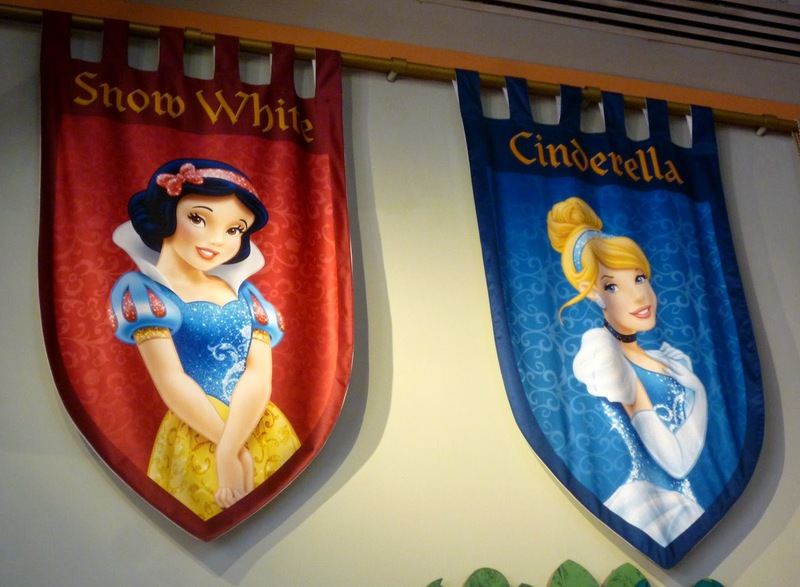 Snow White, of course, is represented by her blue, yellow, and red. 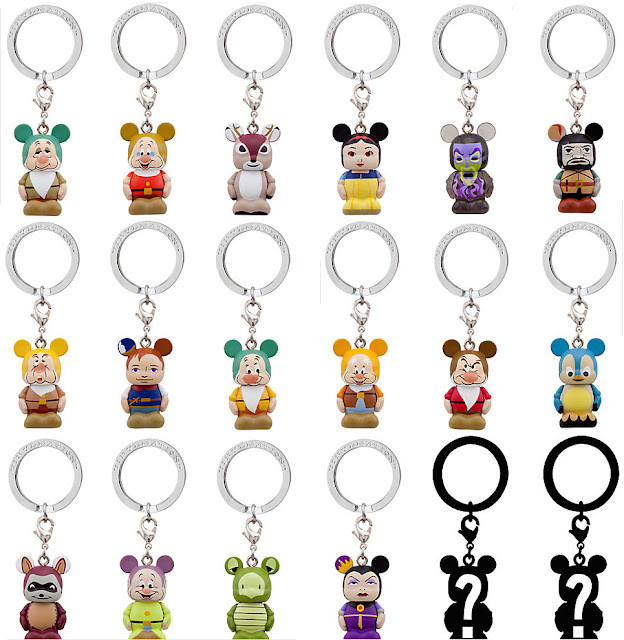 Chip and Dale are the chasers in this set. 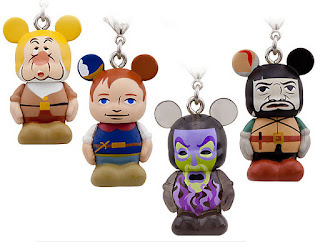 Each figure was sold separately in a blind box, sealed inside the manufacturer's foil bag. "Snow White and the Seven Dwarfs" issued April 20, 2012. Artists: Thomas Scott and Alex Maher. Retail price $9.95 each. 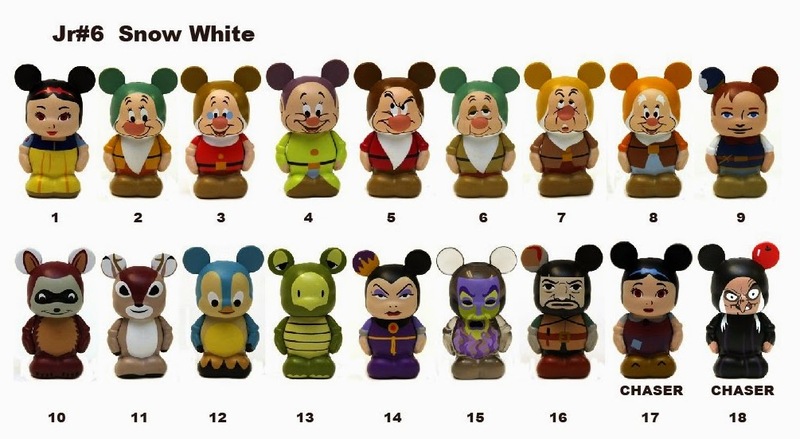 A total of 18 figures: Snow White, Happy, Grumpy, Sleepy, Dopey, Doc, Sneezy, Bashful, Evil Queen, Magic Mirror, Prince, Huntsman, Raccoon, Turtle, Bluebird, Deer and two mystery chasers--Old Hag and Rag-Dress Snow. The designs are quite impressive. 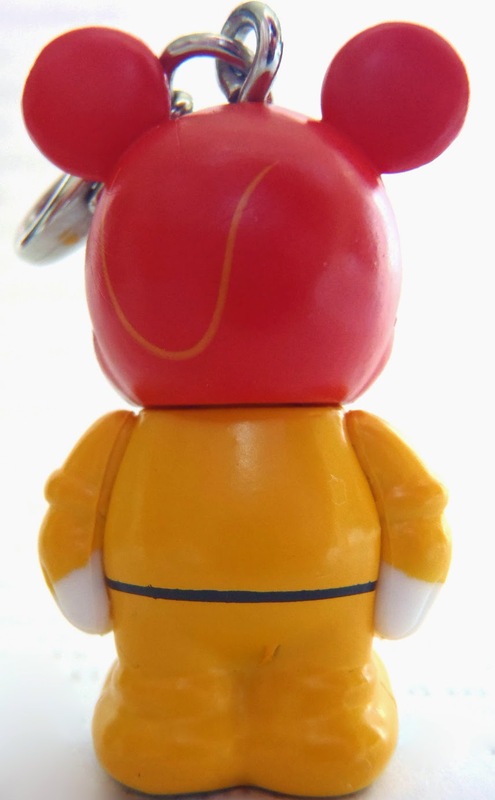 Disney Store Item No. 7511002524328P. 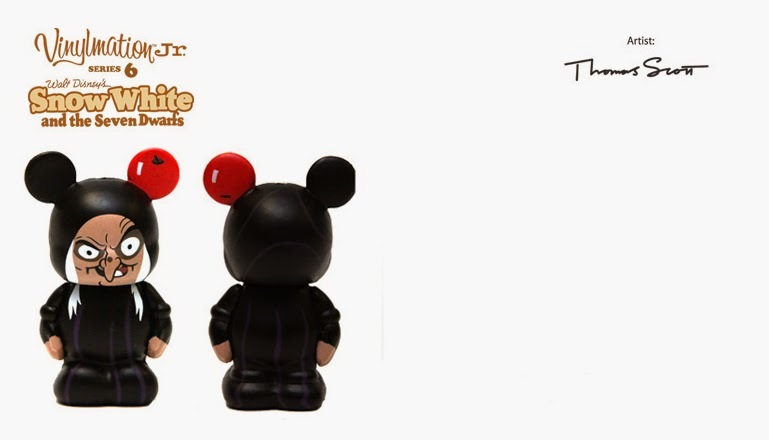 Chaser images via chasing vinylmation. Even the box artwork was nicely done. 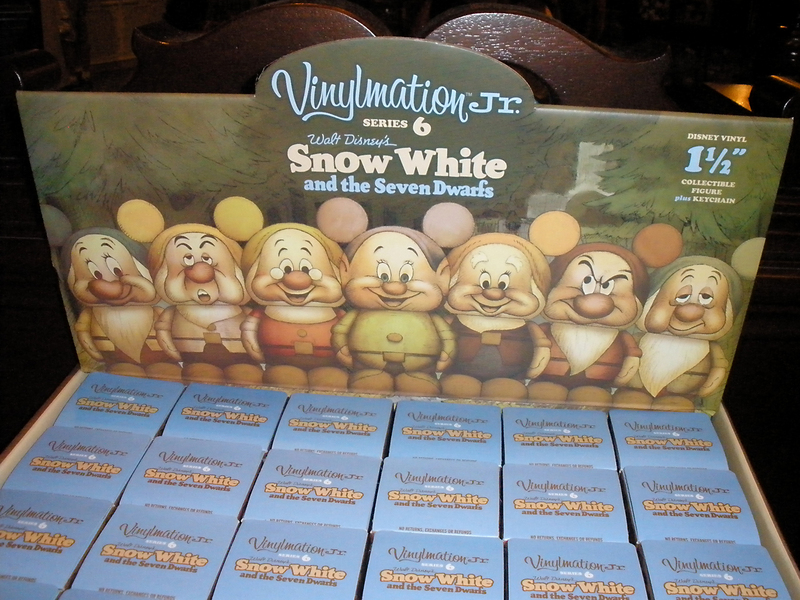 The series was on display at the Disneyland Emporium; photo from July 2012. Emporium images courtesy of Tokyo Magic! of Meet the World. 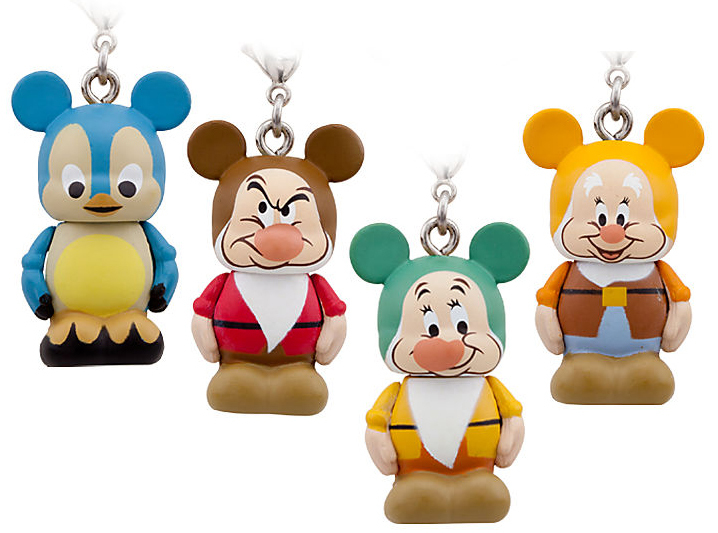 "Dopey" issued April 27, 2012. Artist: Maria Clapsis. 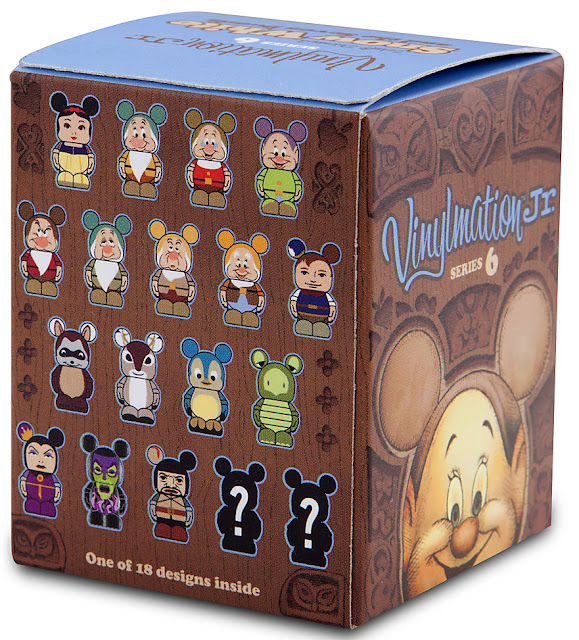 Retail price $16.95. 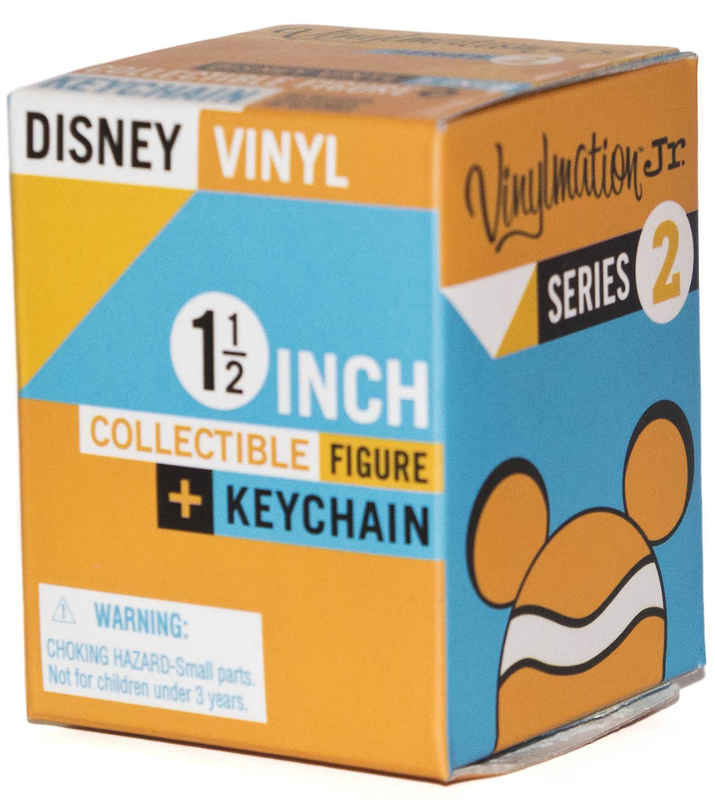 Two-piece set includes Dopey and pop art design. Open window packaging. Disney Store Item No. 7511002524314P. 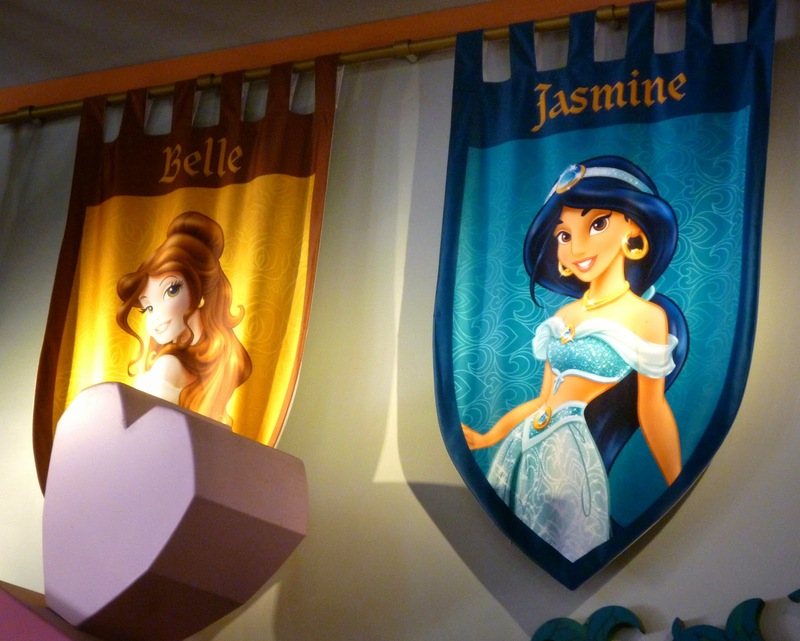 On a visit to Walt Disney World this past May, I snapped these photos of the princess banners on display in the World of Disney store at Downtown Disney. 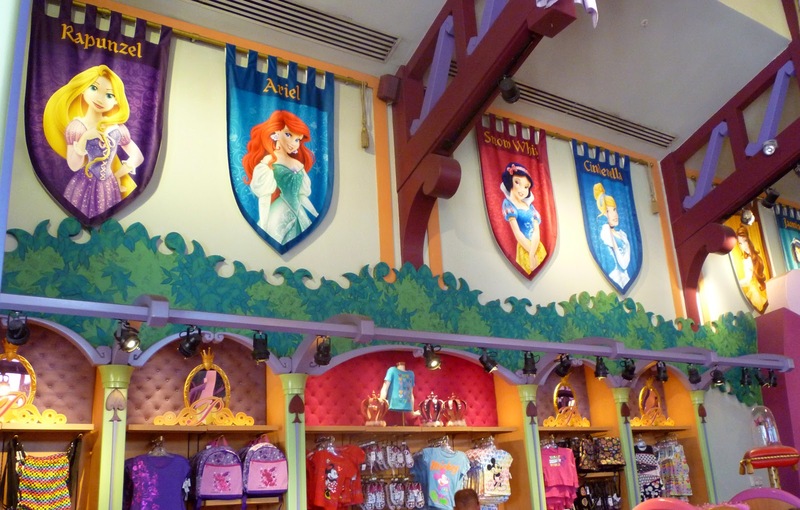 Just a few years ago, this same upper wall area was covered with several larger banners featuring a few of the prince and princess couples together. 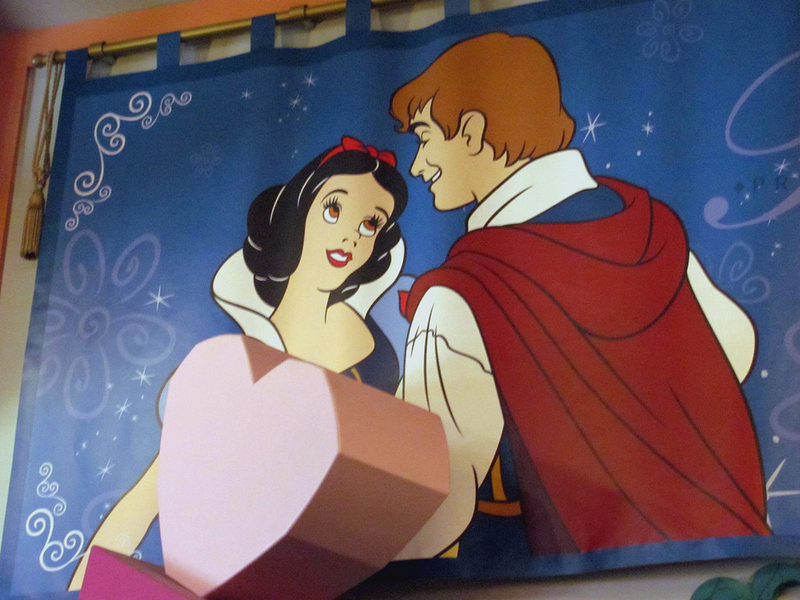 Snow White was one of them. 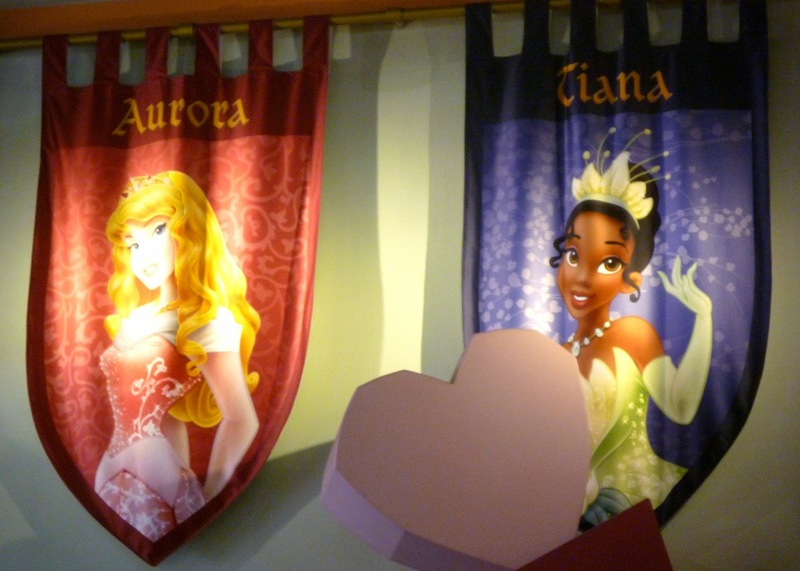 These larger banners were replaced with the narrower solo portraits, which has allowed space for more of the princess characters to be included. In the year 2000, the French Snow White soundtrack was redubbed with new voice actors. 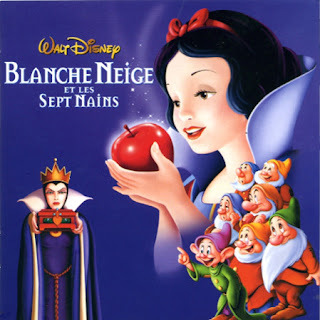 Rachel Pignot was in the singing role of Snow White. Valérie Siclay played the speaking voice. 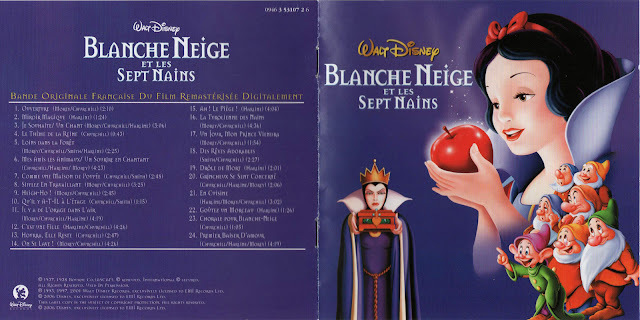 This new recording was issued on the 2001 DVD (and then 2009 Blu-ray). In 2001, a compact disc of the soundtrack was released in France and the European market. Walt Disney Records. No. 0927-42515-2. Enhanced with a CD-Rom movie trailer. Made in Germany. The soundtrack was reissued in 2006 sans the CD-Rom extra. Walt Disney Records, licensed in Europe exclusively to EMI Records Ltd. No. 0946 3 53107 2 6. Images courtesy of the Greg Philip Collection. 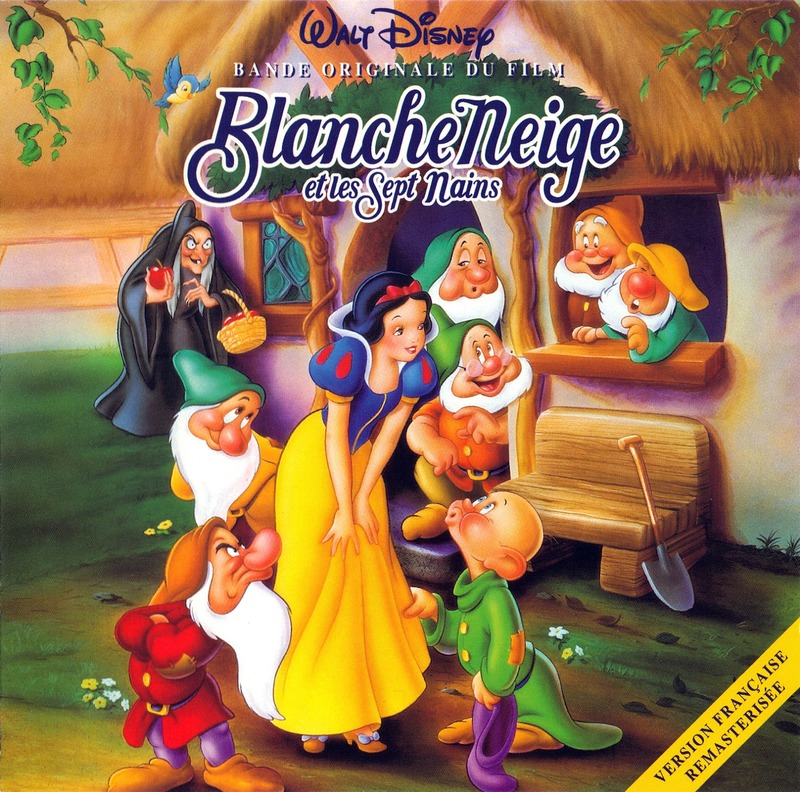 In 1994, the French Snow White soundtrack was released on compact disc. The recording featured the cast from the 1962 re-dub. Lucie Dolène played both the speaking and singing role of the princess. Claude Gensac was the Queen and Marie Francey the Witch. 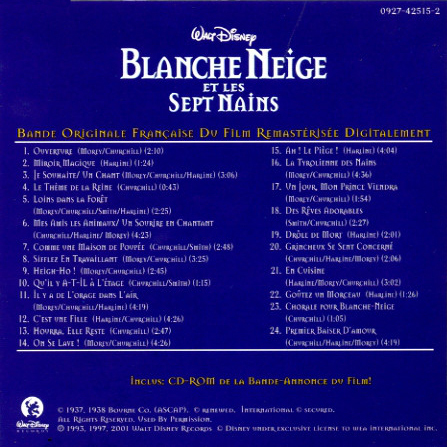 Walt Disney Records. Catalog no. WDR 36016-2. 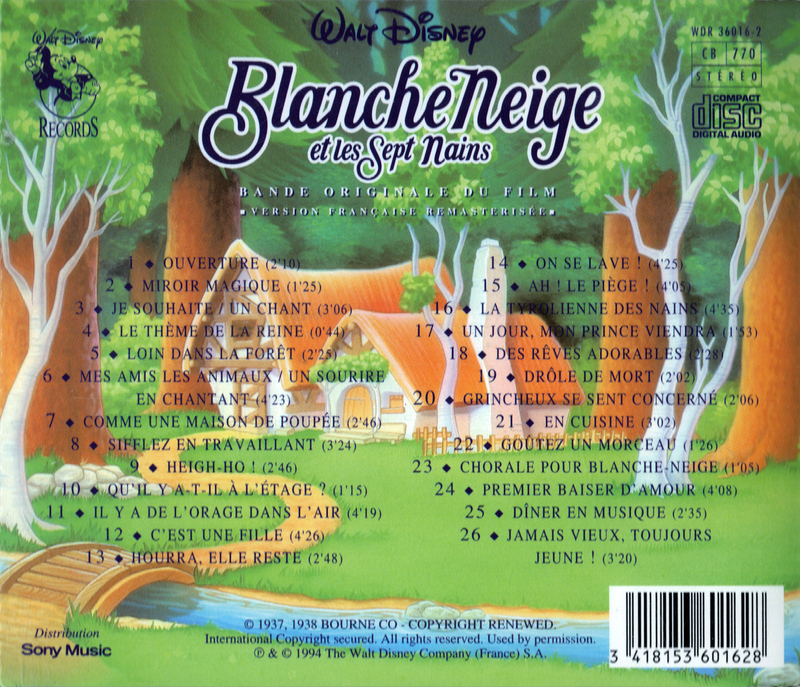 Distributed in France by Sony. 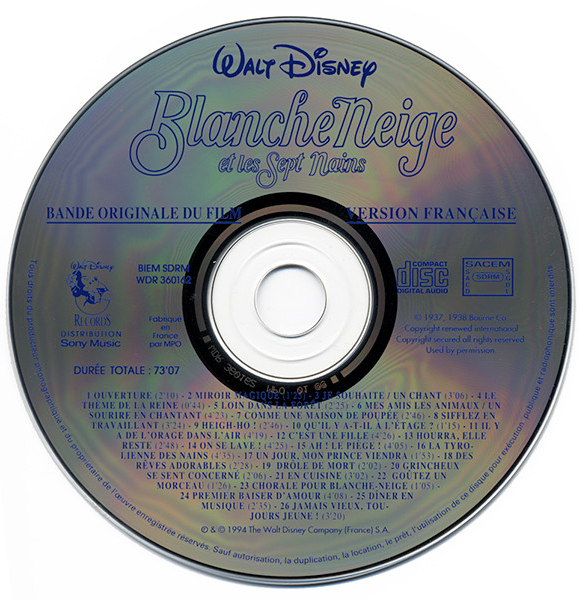 The track list includes a "© 1997 Disney Enterprises, Inc." imprint, indicating a later printing. DVD insert scans courtesy of Greg Philip of A Lost Film.